What is Rigvir and what are the claims made about it? Sometimes a single image says more than a thousand words. But is Rigvir really your chance to live, if you have been diagnosed with cancer? 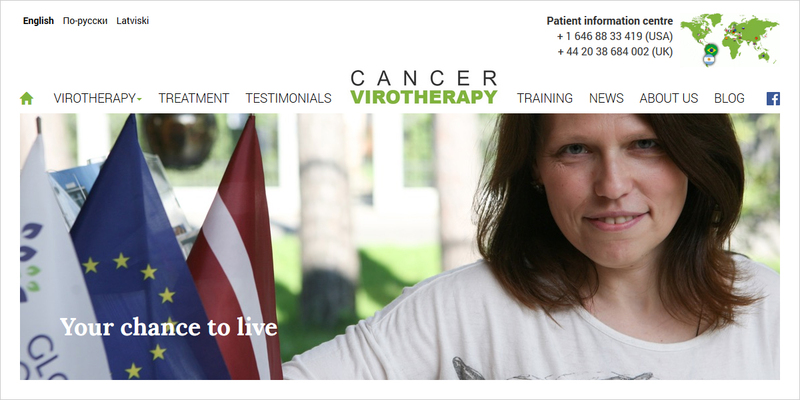 Rigvir is an unproven anti-cancer treatment developed in Latvia. Its proponents claim that it is an oncolytic ECHO-7 enterovirus found in the gastrointestinal tract of young children, that it supposedly destroys cancer cells without harming normal cells, and works in a wide variety of cancers. Importantly, while outside of Latvia Rigvir is only sold by clinics with highly dubious alternative cancer treatments, in Latvia it is an official prescription drug, registered in our State Medicines Agency, reimbursed by the state, and even included in the clinical guidelines for treatment of melanoma. This gives it a veneer of respectability and reassures foreign patients who might normally not choose alternative cancer treatments. Most importantly – this is not an issue that affects only Latvians, as approximately 90% of the income of Rigvir holding comes from foreign cancer patients (USA, UK, Australia, EU countries, etc. ), who get this treatment by traveling either to Global Virotherapy Cancer Clinic in Latvia, or to its quack partner clinics. Author ZimbaPosted on November 5, 2017 September 2, 2018 Categories englishTags Aina Muceniece, alternative, history, hope4cancer, international virotherapy centre, introduction, Latvia, Latvian Health Ministry, oncolytic virotherapy, RigvirLeave a comment on What is Rigvir and what are the claims made about it?